Ultimate Sporting News: Es ist ein Wunder! 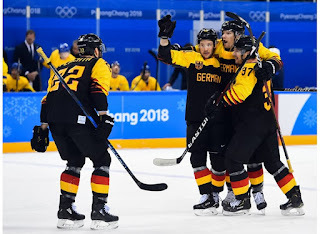 Patirck Reimer drove hard to the goal, skated around three Swedes in the process, and banged his own rebound past goalie Viktor Fasth just 90 seconds into a 10-minute four-on-four overtime to give Germany an improbable victory over Sweden. But since Germany became one country in 1990, there is no result that comes close to tonight's shocker. The team raced to a 2-0 lead, fought hard to make it 3-1 midway through the third, and blew a two-goal lead before Reimer's heroics. 'I’m proud of the guys, how they played, how they worked," said Marcel Goc. "We had a couple of huge blocks from our guys. We tried everything we had, and it was enough today. In OT, everything can happen. One lucky bounce or one deflection and the puck goes in and the game is over. Reimer made a really nice move, I thought, took the puck to the net and put it in." This was not vintage Tre Kronor of Forsberg and Sundin and Sedins and Backstrom. This was more like Tva Kronor (two crowns) or Ett Kronor (one crown). Sweden si going home, and Germany will play Canada in the semi-finals, the winner going for gold, the loser for bronze. "It’s huge for our sport," Goc continued, "especially at the Olympics. It’s not just World Championships, where it’s just hockey or hockey fans. It’s a big platform for us. This game was live in Germany, too. It was a good time. It’s a good advertisement for us. I hope we got some more fans." "We’re really just excited that we have a chance to play for a medal," Goc summed up. "This is a dream come true for us. We might need a few minutes here or a night to let it set and understand what we did here." For us, it’s a huge step forward. Four years ago we didn’t qualify to go to Sochi. This time, I thought we played a great qualification. It’s started to pay off, the work we put in. 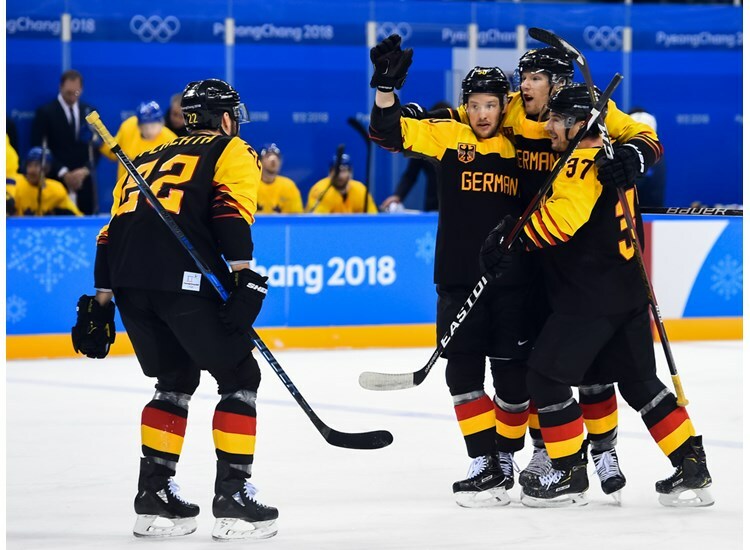 Then, inexplicably, as if a switch went off, Germany gained some confidence, and then got a power play. They took 10:10 to register their first shot, but at 13:48 they opened the scoring when veteran Christian Ehrhoff’s floating point shot drifted under the arm of Viktor Fasth for a stunning goal. One would think a team like Sweden, with such a long and rich history of winning would have re-grouped in the first intermission and came out flying to start the second. Well, that didn’t happen. In the third the tne changed as soon as Sweden coach Rikard Gronborg put out 17-year-od Rasmus Dahlin for his first shift of the night. The Swedes had good pressure, and on Dahlin's third shift his point shot wound up ni a scramble in front where Anton Lander put it in. The Swedes completed their comeback at 11:37 when Mikael Wikstrand's long wrist shot went all the way past a screened aus den Birken. That set the stage for overtime.